Compressed gas cylinders are used across many different industries, ranging from restaurants & medical, to industrial settings, such as construction, warehousing and workshops. While different gases have different properties, they have similar hazards regarding identification and handling, and storage poses a range of complex risks from the physical size of the metal cylinder, to the volatile nature of the compressed gas inside. This is why storing gas cylinders standing upright without chains or cages, or without safety caps placed over their valves, can be highly dangerous. Some industrial gas cylinders can be more than 2 metres high and weigh more than 140kg. If a cylinder falls over, the pressurized valve can shear off, turning the cylinder into a deadly 170 mph torpedo, resulting in a potentially devastating chain reaction. 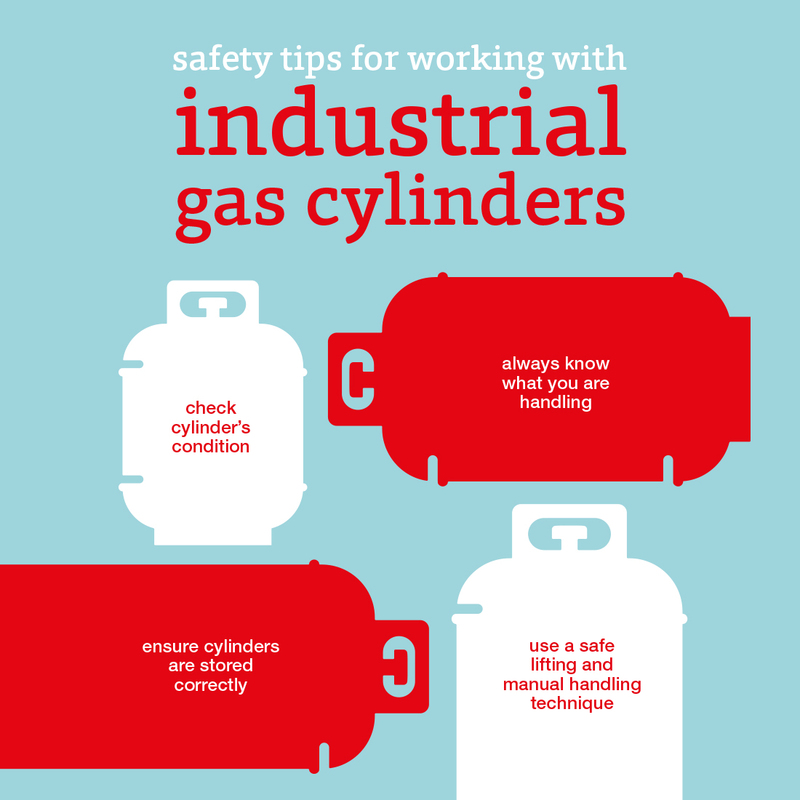 When handling, storing and transporting industrial gas cylinders safely, implementing recognized industry good practices can hugely reduce the chance of serious injuries or even fatalities in the event of any incident. Always use the cylinder label to identify the contents of the cylinder, rather than relying on the colour of the cylinder. If a label is missing or unreadable, don’t use the cylinder. All gases have their own properties and hazards, so if you’re handling or transporting cylinders you need to read the safety data sheets in order to understand that particular product’s key properties and risks. If any cylinders show signs of impact, heat damage or discolouration, treat them with extreme caution and contact the supplier immediately. Gas cylinders need to be kept vertical, and should be stored and used in a well-ventilated, well-drained area, away from sources of heat or ignition and segregated by type. It’s important not to keep any other products in a cylinder store, particularly any flammable materials. You should store full and empty cylinders separately and rotate your stock so that the oldest cylinders get used up first. Secure cylinders properly to prevent them moving or getting knocked over. All cylinders should be secured with straps and chocks to prevent them from rolling around. In particular, ensure the valves are protected, to prevent them from being knocked open while you’re on the move. Always transport LPG (propane) and liquefied gas cylinders upright. If you are moving acetylene cylinders and can’t avoid having them lying down, it’s important to make sure they are stood upright for at least 30 minutes before they are used. When lifting a cylinder, take a firm hold around the neck or collar of a cylinder with both hands. Keep your back straight and move into the cylinder as it rises. Never lift a cylinder by the cylinder valve or valve hand-wheel. Don’t ever try and catch a falling cylinder – let them fall and move away from the direction of the impact. Want to know more about storing industrial gas cylinders ? The Armorgard DrumBank range now offers even greater flexibility and choice with the introduction of new extra heavy duty storage.